Playing table tennis has become a lot easier with the new and improved design of Butterfly’s Easifold 19 Rollaway Table as compared to Killerspin or Stiga. The table comes in excellent quality with an affordable price. It has options of two appealing colors of blue and green table top surface. With its simple assembling feature, you are ready to play in just 15 minutes. The table also built with new logo and corner bits. Let’s take a look on the overall performance of this Butterfly Easifold 19 Rollaway Table Tennis Table. This will allow us to decide about the attributes of the table in a glance. Butterfly Easifold 19 Rollaway has 19mm thick table top surface which is great in terms of bouncing playability. It is made up of stainless steel frames and very attractive magenta corners to improve the aesthetic look of the table. There is an exquisite humidity protect finish beneath the table. The table has height adjusters to suit the requirement of players of different heights. Height adjusters perfect your game with leveling the table as per the surface. The table support bars provide extra strength to support the table. This table is designed to assemble into two different halves and each half of this table consists of 2 legs, which can be folded into a standing structure to ease for mobility of moving the table back & forth and storage. There are 4 independent wheels for each half of the table and one of the wheels has a brake for securing the table. The wheels roll very nicely. Due to its nested two halves fold, the table takes very less space. The mechanism of locking two times is provided to prevent the table from accidentally opening or closing during storage. Another amazing feature of the table is the playback feature where one-half of the table can store vertically and a single player can practice alone on the other half table. The table is come together with a quality Butterfly clip net. Warranty: The warranty given for this table is three years. The table’s assembly is very heavy. One person cannot assemble the table alone. During the storage, the net has to be detached. Recommended for home use since it is little flimsy when used a lot in schools or clubs. Personally, I love this wonderful table. It is well-built, easy to use and great to play on. If a rating scale is to be considered, then ignoring its mild cons, I will be glad to give this Butterfly Easifold 19 Rollaway table a rating of 9 out of 10. So guys, just pick up any of the varied options of the Butterfly Easifold 19 Rollaway Table and get ready to gear yourself for an astounding game of table tennis. Use it to play indoor with your friends and family or be ready to give a tough competition to your opponent in an outdoor table tennis game. 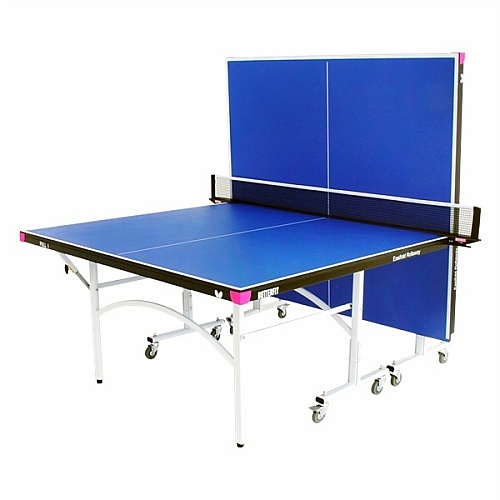 There are still other quality Butterfly table tennis tables that you can take a look.